All year round, CBLDF works hard to protect the right to read. Our efforts combat the rising tide of censorship facing students, educators, and libraries, and we continue to provide a valuable safety net for creators and retailers. We can only do this work because of the generosity of of our supporters. Today, we’re asking you to help us continue this important work by making a #GivingTuesday tax-deductible donation to CBLDF. When you do, we’ll thank you with our #GivingTuesday edition of Defend Comics, a 54-page all-star anthology featuring stories by Neil Gaiman and Jim Lee, Jason Aaron and Moritat, Andy Diggle and Ben Templesmith, Terry Moore, Sergio Aragones and Mark Evanier, Evan Dorkin, Amy Chu and Shannon Wheeler, and many more! This anthology is only available on #GivingTuesday, December 2, until 12:00 a.m. PT. 2014 was a busy year for CBLDF. We addressed more than two dozen challenges to comics and other books, including a national outbreak of summer reading bans. We defused several legal crises before they could rise to the level of prosecutions. We took a leadership role in Banned Books Week‘s 2014 comics focus. 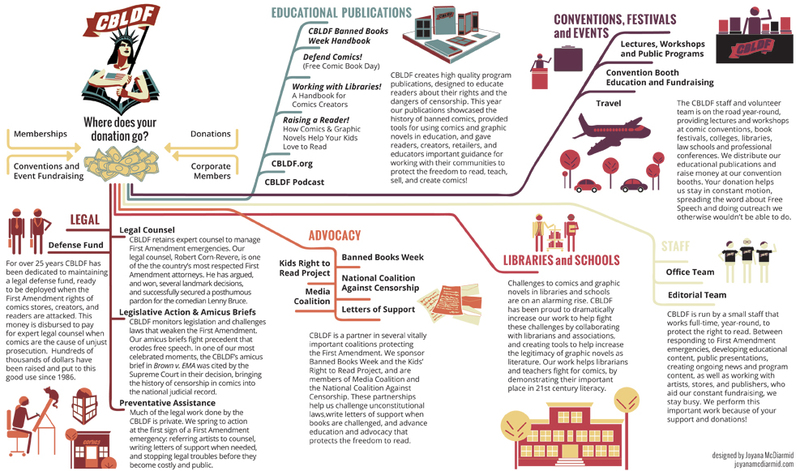 We also added to our expansive education mission, with several new publications, more than 40 public presentations, a new monthly podcast, our weekly newsletter, and daily news and resource content on cbldf.org. CBLDF does all of this work, and more, with a small dedicated staff. Our 2014 Annual Report goes into even greater detail about the difference your donation makes in helping us protect the freedom to read! 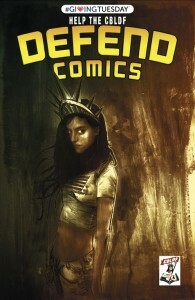 Plus pin-ups by Ben Templesmith, Frank Miller, and Jeff Smith! Please help CBLDF continue our important work by giving back with a tax-deductible donation this #GivingTuesday!